I’m starting to think of the education privatizers as the Jason Vorhees of the public policy world. If you’ve never seen any of the Friday the 13th movies, allow me to explain. Jason Vorhees is this deranged killer who continually attacks teenagers away at camp. Try as they may to defeat him, he is continually resurrected and resumes his attack on the campers . There is one scene in Friday the 13th Part 2 that epitomizes the whole existential problem. The majority of the movie deals with Jason stalking these kids at Camp Sleepaway. Towards the end, this one young lady defeats Jason several times, but he keeps coming back despite all of her efforts. At last, though, she delivers what should be the debilitating blow. The final scene shows her floating in a boat on the lake, exhausted from her battle with Jason, but confident she’s beaten him. Suddenly she sits up and out of nowhere, Jason’s rises from the lake to engulf her and drags her down into the murky waters. That moment perfectly encapsulates the battle we are facing against the privatization of public education. Allow me to elaborate. Last summer in Nashville, we had a fierce campaign for school board of Metro Nashville Public Schools (MNPS). Four champions of public education ran against four candidates supported by the privatization movement. Teachers and parents all joined in to beat back the challengers. The four public education champions won an overwhelming victory despite being radically outspent. It was a clear-cut mandate from voters that they were happy with the way charter growth was being managed and did not welcome any more privatization efforts in Nashville. We all enjoyed a night of celebration. Should have been the end of story, right? But not so fast. While teachers and parents were busily knocking on doors and campaigning for the champions, something else was taking place behind the scenes. 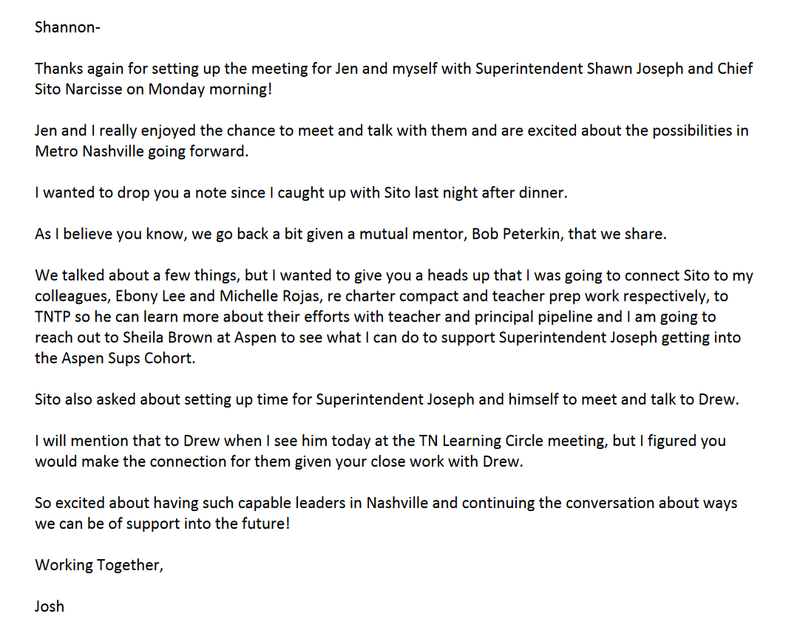 It seems Shannon Hunt, who heads up the Nashville Public Education Foundation, was working off a different agenda. 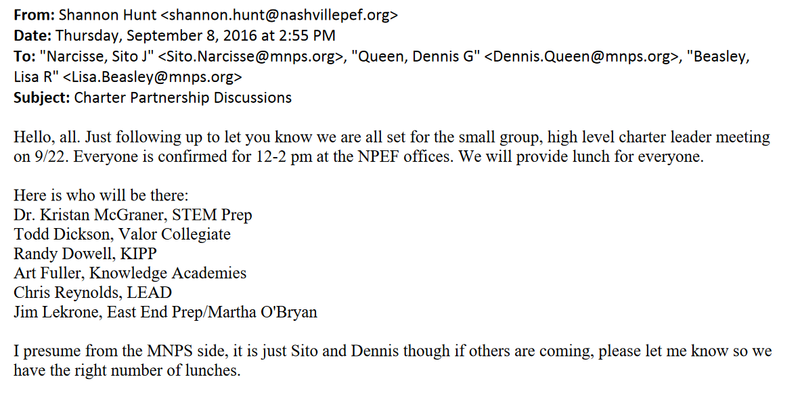 NPEF, for those unfamiliar with the organization, is a Nashville non-profit focused on public education. They were enlisted by the MNPS school board to assist in the recent search for a new director of schools. At the time, I had severe misgivings with their involvement despite being repeatedly assured they had no hidden agenda. Hunt’s email reads like someone who has an agenda to me. Josh Edelman is the brother of Jonah Edelman, who runs Stand For Children, and he seems to be getting a seat at the table in Nashville where his brother couldn’t. In fact, a lot of champions of privatization seem to be getting a seat at the table. The last couple of months have seen Dr. Joseph hire someone who led the fight to create charter schools in Washington for the Chief of Staff position and hire a Broad Academy graduate with no classroom experience as Executive Director of Professional Learning. This doesn’t seen to be congruent with the vision expressed by people during the election. It bears repeating, so it’s crystal clear, that at the same time parents and teachers were working to beat back privatization forces, Shannon Hunt was taking advantage of the access granted her by her position as the head of NPEF to push a personal agenda. One that was certainly not a continuation of the true community driven process that NPEF promised when they agreed to pay for the search. This is why constant vigilance is called for. Admittedly, I don’t know what the outcome was of any of these meetings as this administration continues to struggle with transparency. I do know that there have been several more meetings between the people who tried to buy this summers election and district administration. NPEF has pushed for meetings between the new administration and the leaders of specific charter schools and there have been meeting on teacher training involving Project Renaissance and its teacher residency program. Luckily Pinkston and Frogge while putting on a more muted public face are still fighting behind the scenes and for that we are fortunate and grateful. It still doesn’t change the fact that despite a rousing defeat at the polls during the past school board election, the privatizers are still getting an audience. While we lay exhausted from a hard fought campaign that we thought would move us beyond defending our schools, here come the privatizers surging out of the lake and pulling us back in to the murky waters again. Though a message was clearly and strongly sent by voters, was anyone listening? This phenomenon is not exclusive to Nashville either. This past election day, voters were faced with two major referendums on privatization efforts. In Massachusetts, it was on charter growth, and in Georgia it was the creation of a charter school zone. Voters said no in both cases in resounding fashion. It should be time to celebrate and refocus the conversation. Not so fast though, because despite those victories, Donald Trump, a school choice advocate, managed to win the presidency. Like Jason Vorhees surging out of the lake to renew his attack against our exhausted heroine, the Trump victory empowers the privatization forces to renew their attack on public education with increased vigor. There is rampant speculation over who Trump will name as Secretary of Education. But does it really matter? I’d argue that it doesn’t. The storm is coming, and we’d better get our houses braced for it. My point is that no matter how much we continue to demonstrate the failings of the reform movement, we can’t defeat them just by talking about how damaging they are. If a real storm was on the way, we wouldn’t prepare just by telling people how bad storms are and how much damage they can do. We wouldn’t be standing around sharing stories about the havoc that previous storms have wreaked. We’d be up on the roof making sure all the shingles were nailed down. We’d be making sure our shutters were strong. We’d be doing the hard work of getting our homes prepared for damaging winds and rain on the way. That’s what we should be focusing on with our schools. We should be doing everything possible to make them attractive, welcoming, high-functioning places where families want to send their children and parents feel listened to. Instead of telling people how bad charter schools are, we should be telling them how good our public schools are. We should be directing every bit of our resources into making sure that children have everything they need to learn. It is imperative that we establish that strong emotional connection between communities and public schools. We can continue to point out how bad charter schools are, but if we don’t establish how awesome our public schools are, we are setting up people to choose what they perceive as the lesser of two evils. The narrative will become, “Yeah, I know charter schools aren’t great, but public schools are really bad. So let’s give the charters a chance.” If you don’t believe me, just look at the presidential election. Democrats spent a great deal of time painting a picture of how bad Donald Trump was. They spent very little time explaining why Clinton was better for them. She failed to make that emotional connection, and therefore, was unable to secure the presidency. We can’t afford to do the same with public schools. Our public schools are under attack on so many fronts. If we continue to just play defense, eventually the ramparts will be stormed. It’s imperative that we start sharing as many positive stories about our public schools as we do about charter schools. It’s why I’ve created the Dad Gone Wild Facebook page. The Dad Gone Wild Facebook page is dedicated to showing pictures and sharing stories of positive things happening in Middle Tennessee schools, focusing predominately on MNPS. Occasionally there is an article to educate parents, but the main point is to celebrate the positive happenings in our schools. It’s my attempt to make an emotional connection with the schools and our community. That’s just one example of what can be done, though. Schools are always welcoming to parent volunteers. Community members need to get in the schools and then share their positive experiences and collaborate to fix the negative ones. Administrators need to ensure that resources are truly being dedicated to the schools and not being diverted to their benefits. I can promise you this: the public will not continue to rally to the defense of public education if district administrators are perceived as fat cats feeding at the trough. Taking away a choice is not an option unless you can provide an as good or better option and it has to, at a bare minimum, be able to pass the eye test. Parents and community members will not even consider your deeper arguments if they can’t look at a school and see that it’s meeting their basic standards. Telling people how things are going to improve next year is not going to cut either. Ever go to a restaurant that opened before it was fully completed and you suffered through its shortcomings while the owner described the wonderful things they were going to do in the future? Did you soon return? Mobility also plays a huge factor with our high needs schools and the truth is many of those children won’t be there next year. 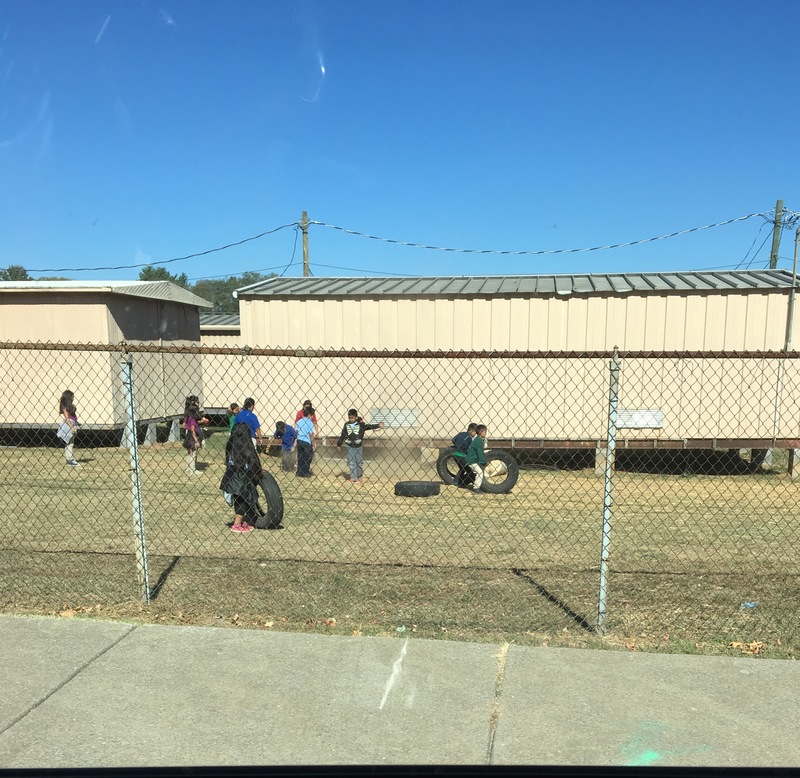 The picture to the left is what recess looks like at my children’s school, a high English learner, high poverty school. 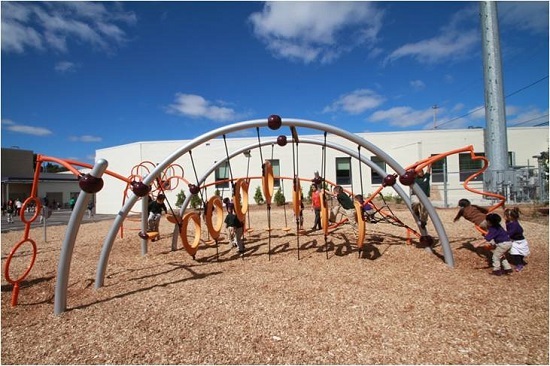 The other picture is what the playground at a Rocketship charter school looks like. How do we look a parent in the eye and tell them that the public school is the best option? The only way to do that is to make it 100% true and 100% apparent to the eye. Otherwise we’ll just keep being dragged back into the lake. I just wish parents would start taking their kids out of the public school system in huge numbers. 1. the kids would get a better education 2. the kids and parents will be a lot happier 3. it would put all these deceivers out of a job. It is truly the only way to put and end to the lies, greed, deceit. It surely won’t happen in DC or in our Capitol in Nashville. I pray the day will come when parents understand they have the power to put an end to this scheme if they would only resign themselves to pulling their kids out of the system for a year. Of course I hope they would never send them back but I also know that in one year we could DRAIN THE SWAMP in Tennessee. Thank you TC for posting this. The privatizers are poised to make money in Nashville. The Nashville Public Education Foundation is a joke. They are rich folks who send their own kids to private schools. 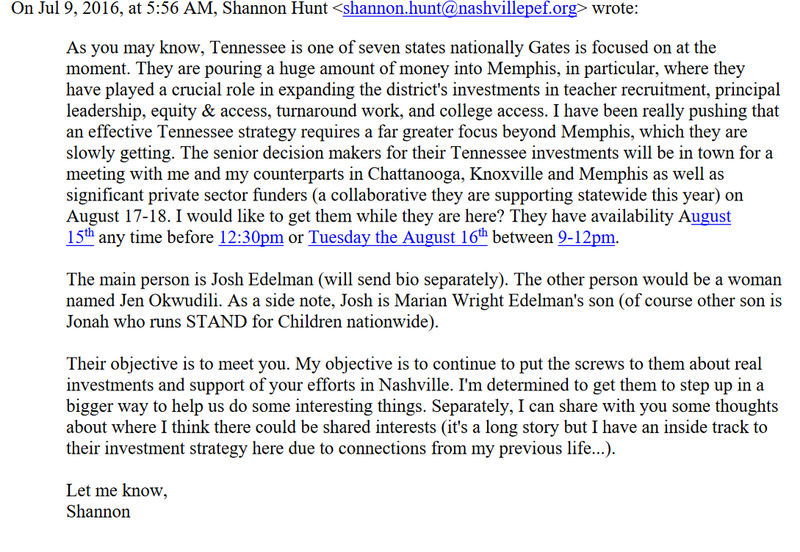 Please write about the people on the Nashville Public Education Foundation. Many of them sent their kids to private schools. So why are they so interested? Personal profit?